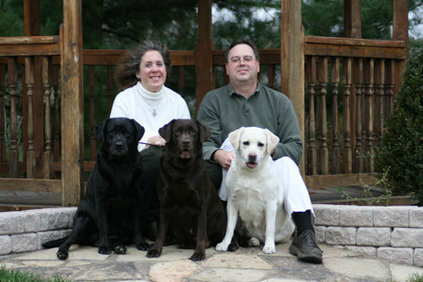 Devanley Labradors has been around since 1999 when we decided to purchase our first Labrador Retriever. After speaking to our veternarian, we called a breeder in Caro, Michigan. Kathy Johnson was more than happy to answer all of our questions and helped us decide to go with a male. Pineview's Mr Bark Ley was the love of my life - he went everywhere with me and he was always by my side. I was at his side when he lost his battle against cancer one cold November night at the young age of 5. His memory lives on forever in my heart as well as in our kennel name and in namesake of our black foundation female - Leya. Since then we have added to our kennel numerous wonderful girls - chocolate, yellow, and black and several great males - also chocolate, yellow and black. Our dogs are loved by our entire family (Mark and I have 3 human boys) and are kept in our home. We are excited with the great health clearances that the older girls and boys have received and we are looking forward to the young boys and young girls maturing. We are continuing to spend time in and out of the show ring. We enjoy spending time with all our Lab friends (two-legged and four-legged) and being active as President and Webmaster in our local Labrador Retriever club, LELRC, and we are members of our local all-breed club, Medina Kennel Club as well as members of the National Labrador Retriever Club. I would like to thank Kathy for allowing us to have Barkley in our home. We learned so much with Barkley and he brought so many wonderful dog friends into our lives. I also want to thank Connie Bowen for two of our foundation girls and Laurie Pierce our other foundation girl. A special thank you to Jenny Mitchell for the co-ownership of Tango, our non-Devanley boy. The name Devanley comes from two very special animals - Devan Champion and Pineview's Mr Bark Ley. Devan was my Morgan horse that I owned for 25 years. He came to live with me when he was 13 years old and I was 14. I learned many things during the course of those 25 years from Devan. He was a beautiful chestnut gelding with a star and two white socks. 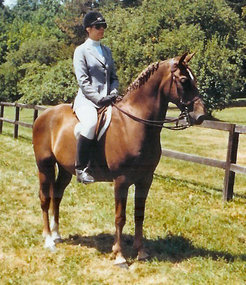 He was very versatile - I rode him hunt seat, saddle seat and western. He was trustworthy - he never did anything mean to anyone or anything. I lost him one month shy of his 38th birthday. He had a wonderful long life. The ley part of Devanley comes from Barkley. For as long as Devan's life was, Barkley's was short. Unfortunately, Barkley died 6 months (plus 2 days) after Devan. Barkley was that special "once in a lifetime dog". He never won BOB at a show but he was BOB in my heart and mind.